Banks don’t lend out reserves. Or do they? The money supply comprises several elements. To make things simple the monetary base is the ‘real’ money (remnants of the gold standard and since then, created by the central bank) and the rest of the money supply is some sort of credit money created by the banking system. The ‘real’ money (monetary base) is also what we call high-powered money, and comprises both physical cash and… reserves held by banks at their respective central banks. Credit money created by banks is actually a claim on high-powered money, or high-powered money substitute. Reserves are convertible into physical cash and vice versa. 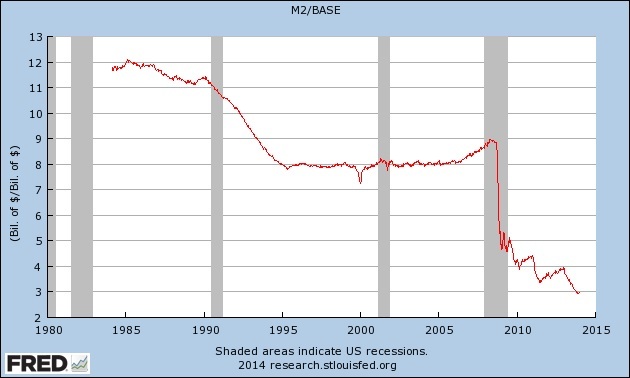 In the UK, the monetary base represents about 17% of M4 (a measure of the money supply that does not include reserves). Reserves represent 82% of the monetary base. A simple question that could come to anyone’s mind is: what do banks lend out then? To be honest, I think that a large part of the misunderstanding comes from semantics. I actually agree with Frances on a number of points she makes. I have some objections to her ‘extreme’ view, or at least ‘extreme semantics’. Things aren’t that clear-cut. While the endogenous money view suffers in my opinion from fallacy of composition, it looked to me at first that the view that banks don’t lend out their reserves suffered from the converse fallacy, the fallacy of division. But it doesn’t look like Frances falls in that trap, given what she made clear in the comment section of her article. To be clear, banks do need reserves. If a (single) bank makes a loan to a customer, the bank is going to increase both its assets and its deposits (liabilities) by the amount of the loan. So far it does seem that the bank has created money out of thin air. But what happens if the customer withdraws the money from the bank? Deposits will get back to their previous amount, creating a discrepancy with the total loan figure. At the same time, there will be a drain on the bank’s reserves equal to the amount of the loan, as reserves will have been converted into physical cash (while total high-powered money remained the same). Seen this way, we could probably say that banks do lend out reserves. What happens if the customer doesn’t withdraw the money but pays with it for a good by bank transfer? The drain on reserves still occurs as the beneficiary bank knocks on the door of the borrower’s bank to get hold of the money. In this case again, we could probably say that banks do lend out reserves. when a bank creates a new loan, it also creates a new balancing deposit. It creates this “from thin air”, not from existing money: banks do not “lend out” existing deposits, as is commonly thought. As we can see, reserves are used for two things: cash withdrawals and interbank settlements. Let’s now consider the banking system as a whole in a closed economy. If lending leads to cash withdrawals, we could say again that banks lend out their reserves. However, let’s consider the following case: nobody ever withdraws cash. In this situation, all payments are made by electronic bank transfer. While individual banks experience fluctuations in their reserves, the total amount of reserves in the system never changes. Here, we could say that, indeed, banks don’t lend out reserves. Here is what I meant by fallacy of division: what is true of the system as a whole isn’t for individual banks. This is something I cannot agree with. She is right to say that reserves will permanently be higher than before they were created (at least until the central bank tries to destroy them one way or another). But she overlooks the multiplier effect on lending and deposit expansion. Assuming no reserve requirements, a fractional reserve bank will estimate how much high-powered money it needs to retain in order to face withdrawals and settlements. It is well-documented that banks in free banking systems naturally maintained reserves. Let’s assume that a whole banking system estimated that it needed to maintain 10% of the amount of its deposits as reserves to face settlements and withdrawals without endangering its existence. This would de facto become an internally-defined reserve requirement. The system can now create a maximum amount of demand deposits (claims on high-powered money) equal to 1/RR = 1/0.10 = 10 times the amount of reserves in its vaults*. The question becomes: why didn’t banks expand their loans and deposit base in line with the increase in reserves? According to the chart below, the M2 multiplier (obtained by dividing all demand and saving deposits by the monetary base), declined significantly when the Fed started its quantitative easing policies. I don’t think anybody has a clear answer to this. Low demand for loans, the Fed now paying interests on excess reserves, maintenance of precautionary excess reserves to face a possible future liquidity squeeze as long as the crisis isn’t completely over, are some of the possible underlying reasons. From my experience, the third reason is highly likely. I’ve heard many banking executives over the past few years who made clear that they were temporarily hoarding extra cash and reserves not to lend but… “just in case”. , with c being the amount of reserves deposited, r the reserve/deposit ratio and k the derivative deposit/loan ratio (derivative deposits being the amount of newly-created deposits by lending that are not withdrawn or transferred by the depositors). Moreover, things get even more complex when you add in secondary reserves (very liquid low-yielding financial instruments almost instantly convertible into cash), as well as technology and financial innovations that allow banks to economise on reserves. This is the best thing I’ve read on this issue. I’ve been so confused about it. It seems like economists fall into the two camps of how to explain loans and money creation — those who say that deposits and/or reserves are lent out, and those who say (very emphatically) that they aren’t. There are very reputable people in both camps, so I didn’t know what to believe. This makes it crystal clear. Thank you!